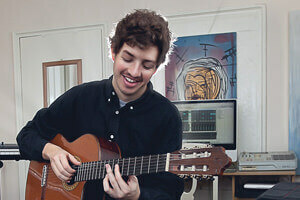 Guitar lessons in London with Edward B.
I have over ten years experience in both performing and teaching on the guitar. I started playing guitar at the age of 7 and have been passionate about music ever since, going on to study at University level and consequently touring the UK and abroad as a soloist and with signed artists. I always tailor my lesson plans around the individual, as I understand that everyone has something different they want to get out of the guitar. I keep lessons fun whilst emphasising the practice of the instrument to ensure that my pupils progress to the best of their ability. I specialise in taking beginners, in whatever style they choose, to intermediate level. Though I can also teach more developed students. After making contact, Edward will normally be in touch with you within 48 hours. You will also receive a confirmation email, which includes Edward's contact details.